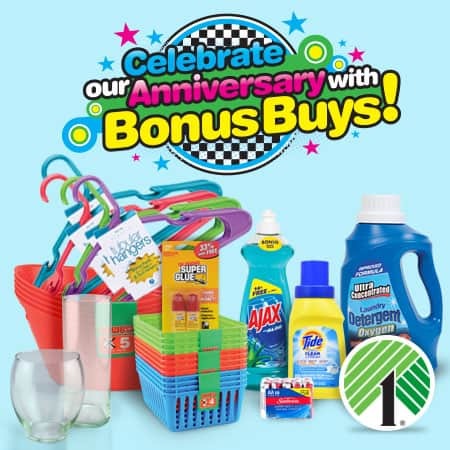 I’m excited to be partnering with Dollar Tree in this post to share their Anniversary Event Bonus Buys with you. Are you a Dollar Tree fan? You know I am a thrifty gal so I cannot pass up a good deal. Dollar Tree is one of my favorite places to pick up organizing supplies and holiday decorations. Today is a great day to shop, it’s the Dollar Tree Anniversary Celebration where you can get larger quantities of your favorite items for a $1. I’m excited to get to stock up on cute storage bins for my office! This celebration ends today, online and in stores, so stock up now! Shop here – Dollar Tree Anniversary Celebration. One of my favorite things to do is browse through Dollar Tree and pick up seasonal items. I always get quite a bit for my buck. A couple of weeks back I picked up some decorative fall leaves. Little Lady took a handful and went to town on a top-secret project the she isn’t sharing with me yet. 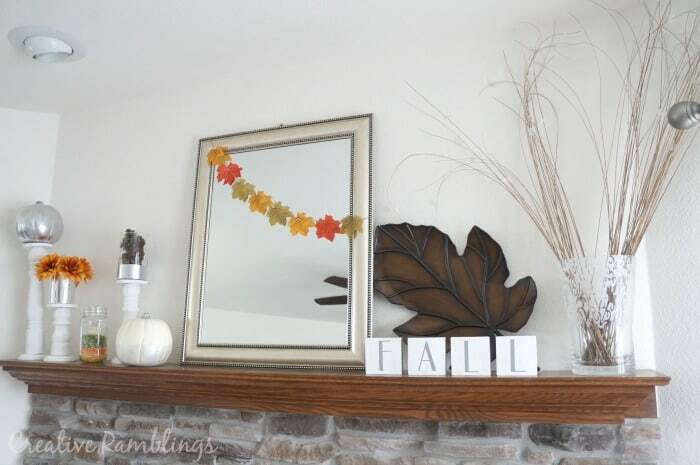 I used the rest to accent a few fall decor pieces around my house. I used one of my frosted glass jars that I made for my summer patio and re-purposed it into a fall indoor lantern. Same effect, different season. My White and Silver Glam Mantle had a little pop of orange already, this leaf garland is the perfect complement. I just punched holes in the fabric leaves and strung them on jute. I used a dozen leaves for these 2 projects and still have 50 left…score! While you are picking up your fall leaves and other seasonal items at Dollar Tree, don’t forget these awesome Bonus Buys. I plan on using the oval bins to corral some crafting supplies in my office. The fun colors will look so pretty on my work table. I’m also picking up some glass vases. Every season I find a new way to paint or decorate a vase. I have 2 on my mantle right now that I painted and embellished. It’s always good to have the supplies on hand when inspiration strikes (this is also why I need extra storage bins). Remember today is the last day of the Dollar Tree Anniversary Celebration and quantities are limited. In addition to the cute totes and organizing items I picked up, you can save on cleaning supplies, health and beauty, snacks and more. Tell me, what’s your go-to gotta have it Dollar Tree buy? 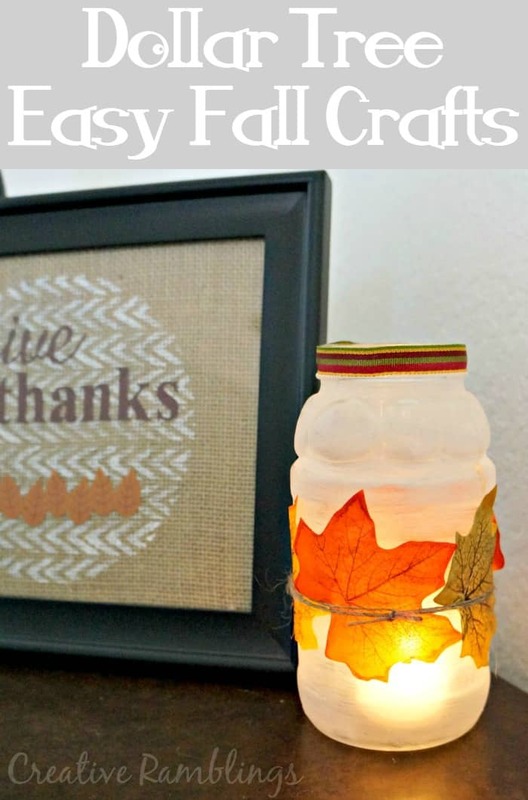 Love that you included dollar tree items into your crafts! This gal is on a budget so I appreciate that! Thanks for the heads up about the sale I went yesterday!